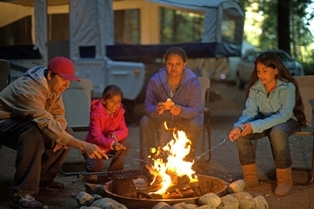 Did you participate in the Great American Campout? The National Wildlife Federation (NWF) encouraged people everywhere to open their doors and sleep under the stars on Saturday, June 23rd, 2012. Great American Backyard Campout was a virtual fundraising event that raised awareness about the benefits of camping, especially how camping connects people with nature. Participants didn’t need to be experienced campers to partake in the fun. All you needed was a backyard, campground, or community location. Sign up was free and fundraising supported vital NWF programs that get kids outdoors for their health and happiness. By signing up participants had an opportunity to win a trip to L.A. or NYC and go behind the scenes with a TV celebrity naturalist. Prizes were also awarded for fundraising! Those taking part in the Great American Backyard Campout directly supported the Be Out There(TM) movement, dedicated to getting children outside so they can enjoy a lifetime of healthy, outdoor fun. If you took part in the Great American Backyard Campout, please share your experience via the comment box below. house, away from their electronic world and take them camping. It is one of the best adventures in RVing for you and them!